Of all casino varieties, Blackjack is the one that has been studied the most, with many numbers experts spending long hours studying the games. In many scenarios, these experts have come up with the perfect decision, meaning that in a given situation, this decision will be the most profitable in the long run. This has meant that you’ll be able to find a number of charts which will tell you exactly what to do based upon your two cards and the one card that you can see from the dealer. Although these charts are very useful, it can also pay to have an understanding of exactly how these charts come into being, and here I look at various aspects that will aid your understanding of the game of blackjack. I’ll finish with a guide to the blackjack charts itself. As you can see from the chart, the dealer will bust most often when the up card is a 4, 5 or 6. These bust so often, that when you look at a strategy chart, it is advisable to stand on any number from 12 to 21 (you’ll obviously hit on any number below 12). Conversely, if the dealer has an Ace, it is very unusual for them to bust, meaning a chart will suggest you hit on every number up to 16. You can use the chart above in conjunction with the following one, which shows you how often you’ll bust when hitting on a certain number. Obviously, you would have to be mad (or extremely lucky) to hit on 20, but I’ve included all numbers from 12 to 20 here. Using both charts, you’ll not want to hit if you have a higher bust out chance than the banker. 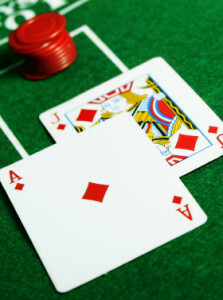 When playing online blackjack, you’ll find that you’ll be able to play with differing numbers of decks at some sites. The following chart shows you the house edge depending on the number of decks. Clearly, the less number of decks in play, the lower the house edge there is, so you should always aim for the games with the least number of decks. However you should ensure that if playing with just one deck that the rules are standard and not some variation of the game.